Western blot analysis of baculovirus-expressed PKC isoforms, using Phospho-PKC (pan) (zeta Thr410) (190D10) Rabbit mAb. 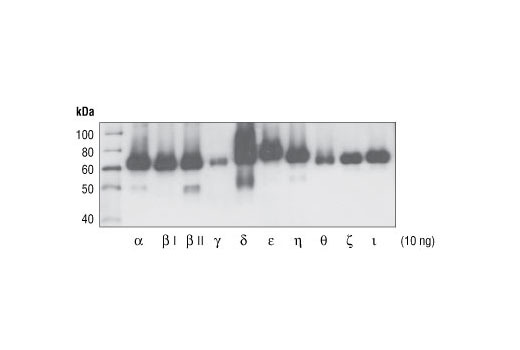 Western blot analysis of extracts from 293, NIH/3T3 and C6 cells, treated with TPA or λ phosphatase as indicated, using Phospho-PKC (pan) (zeta Thr410) (190D10) Rabbit mAb. 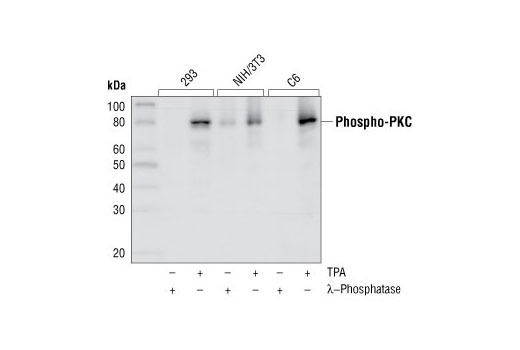 Phospho-PKC (pan) (zeta Thr410) (190D10) Rabbit mAb detects endogenous levels of PKC alpha, beta I, beta II, gamma, delta, epsilon, eta, theta and iota isoforms only when phosphorylated at a residue homologous to threonine 410 of human PKCzeta. Monoclonal antibody is produced by immunizing animals with a synthetic phosphopeptide corresponding to residues surrounding Thr410 of human PKC zeta.